When students returned to classes at the St. John–St. James Evangelical Lutheran School in Reedsville, Wisconsin in January 2018, excitement was in the air. 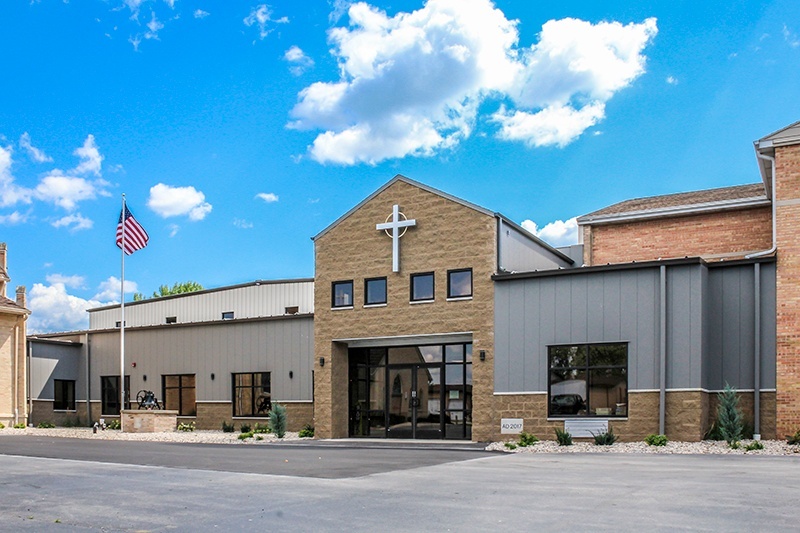 Students, staff and parents lauded the new facilities, made possible by the demolition of an outdated building originally constructed in 1903 and the construction of a 16,500-square-foot addition to the church. The project was funded by a $2 million commitment from the church community that owns and operates the school. St. John–St. James provides quality education to students in kindergarten through 8th grade. Now students can enjoy the new amenities, including a new gymnasium with main and practice courts for basketball and volleyball, a commons area, a kitchen, private offices, locker rooms, and renovated bathroom facilities. The addition also created something the church school community had long wanted: a physical link between the church and school that eliminates the need to exit a building to move between either space. The expansion also creates the necessary space to expand its early childhood program. The school, located at 223 Manitowoc Street in Reedsville, drew a lot of attention in this small, tight-knit community. There was an audience for the demolition work that removed the original structure, making room for new construction. The school's prominence in the community meant that construction also garnered much attention. Our first challenge involved poor soils. That is, of course, after we discovered a house. Yes, a house. The house was removed and hauled off-site. The unsuitable soils around it were hauled to a helpful congregation member's property a few miles up the road, which helped to contain costs. Another critical challenge was fire separation. The existing church and school were not protected by an automatic sprinkler system. It proved to be cost-prohibitive to add sprinklers throughout the entire space. The original code analysis found that a three-hour masonry fire wall would be needed to separate the addition from the adjacent structures. A more thorough analysis found that the rating could be reduced to a two-hour rating, and could be achieved through steel studs and drywall, a cost savings over the three-hour masonry solution without loss of safety protection. The fire separation challenge was compounded by the construction dynamics of the existing building. The fire separation wall would need to be constructed vertically up a section of the church wall behind the altar, covering up a stained glass window and preventing light from entering the space. We developed a solution that allowed a small window to be installed in the wall, allowing light to penetrate into a portion of the window area. 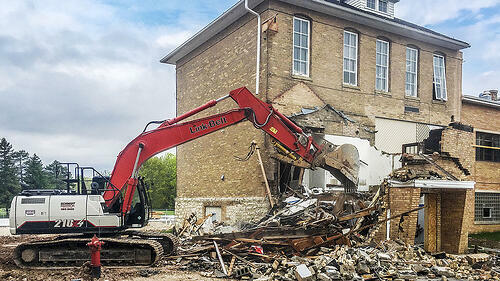 Removal of the original school, which had been added onto throughout the years, was another challenge. We needed to safely and quickly demolish the original building without causing damage to the remaining structure. Our solution involved employing the services of a specialty saw-cutting contractor that was able to slice directly through the stone and masonry elements of the building. Then, A.C.E. crews cut the wood and steel elements of the building free. Using this method, the obsolete structure was razed in less than four hours. The new addition employs a blend of Butler® pre-engineered and conventional light gauge steel construction methods. Other Butler elements include MR-24™ and Painted MR-24™ roof systems, Shadowall™, Stylwall™ and wide-span framing system elements. The school will benefit over time from many durable construction features — such as the tile flooring in the corridor and commons areas, walk-off carpet tile in lieu of roll-up mats, and rolled vinyl flooring with flash cove wall terminations in the kitchen. 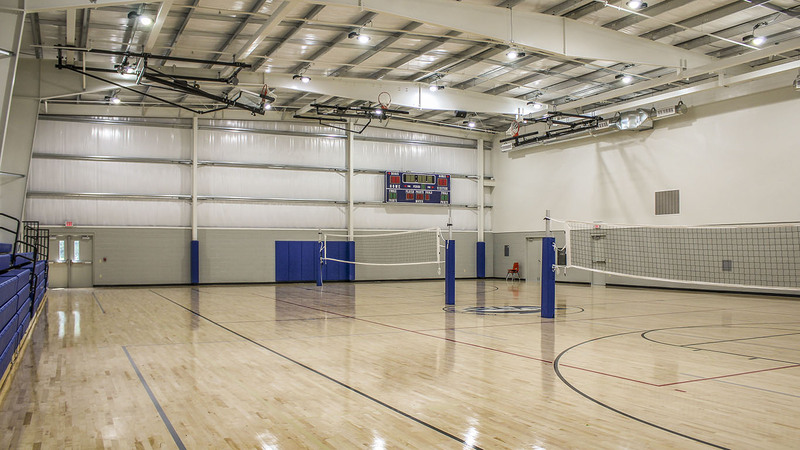 The gymnasium features a real maple playing surface, recessed volleyball upright sleeves, and fold-away basketball equipment. Daylighting techniques were incorporated into the design for both improved exterior views and the use of energy-saving natural light. There are several unique features that delight the school and church community — and our team at A.C.E., too. Three former exterior stained glass windows were salvaged by the church, refurbished, and installed inside the new facility. Additionally, a back-lit stainless steel cross is mounted above the school entry doors — a cross hand-fabricated by one of the members of the congregation. And though the original 115-year-old school building had to go, its bell was salvaged and refurbished by the same congregation member who made the cross. The bell was incorporated into a monument along with the 1903 cornerstone. A.C.E. Building Service Project Manager Eric Augustine and Project Superintendent Bill Shimek worked with an excellent team on the project, including architectural firm Smies & Associates Architects, LLC in Sheboygan and SMI Civil and Structural Engineers, Inc. in Manitowoc. All in all, a project success — made possible by a committed community. And it was designed for some of Reedsville’s most treasured members — its young people. Chris is a graduate of the University of Wisconsin - Platteville where he earned his Bachelor of Science degree in Construction Management. A LEED accredited professional (AP), he began his career as an estimator for a local construction company and worked in field operations for a road construction company prior to joining A.C.E. in 2005 as an estimator/project manager. Chris works with owners to develop construction projects from the idea to design phase to construction. 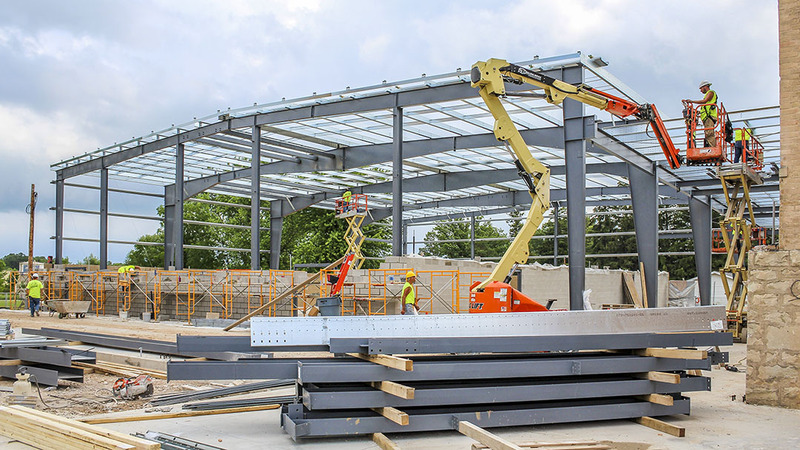 Much of his work is in pre-construction services where he assists owners in land selection, performs feasibility studies and works with government officials to obtain permits and approvals. He helps align owner’s goals with finished building projects and serves as the owner’s representative to A.C.E. construction personnel.